Paintball is a combination of hide and seek, brandy & chess. 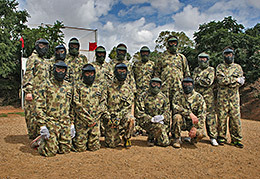 The most common paintball game is 'Centre Flag'. In this game two teams start at opposite ends of the field. Both teams are trying to capture the flag from the centre of the field & hang it on their oppositions base to win the game. During the game players use air/gas powered paint guns to try & eliminate their opponents by tagging them with capsules filled with a paint like liquid. Players use barricades to protect themselves from being tagged and strategically advance up the field to try and outplay the opposition. Paintball is a game played by millions of people worldwide. It is one of the fastest growing extreme sports and one of the most popular activities for birthday & bucks parties through to corporate team building. We often hear players say "It doesn't hurt as much as I thought". Getting tagged with a paintball is similar to a sting from a rubber band flick. The sting may last for a few seconds but then you are ready and pumped for the next game. The more into the game you are & the more you want to win the less you will feel it. When I am playing tournaments I am so focused on trying to win that I often say if paintballs hit any softer you wouldn't even know you were hit. Paintball has grown into one of the fastest growing extreme sports in the world & lasted 20+ years. This would not be possible if it hurt too much. In South Australia the Government have set the minimum age as suitable for players from 10 years of age. We use good quality paintballs that are brittle & break easy on players. We also provide custom overalls with inbuilt neck protection, good quality masks & we even have padded vests for players if they require free of charge. Players MUST be 10 years of age or above as per South Australian Firearms Law. Players under 18 years must have their waiver form completed by their own parent to play. We require bookings in advance so we can structure the day & prepare. We recommend as soon as a group knows when they want to play to let us know as far in advance as possible as some days fill up weeks in advance. We will always try to accommodate for last minute bookings too. Can we play paintball today? Please arrive 10 minutes before your processing time. Please Note: Your processing time is the time we start processing NOT the time you start playing paintball games. Processing can take some time and varies depending on how many players there are to be processed, if players are late, if players' waiver forms need corrections etc.. We work as fast as we can but we can't and won't cut corners as our paintball players safety is our number 1 priority. To help your group start playing paintball games quicker, please ensure all players arrive on time and waiver forms are completed with ALL details. We recommend 9am & 10am processing all year round especially in Summer to beat the heat. Anywhere from 10 minutes to 3 hours.... Some players are trigger happy and blast through their paintballs and other players are conservative and make every shot count. On average approx 95% of players buy extra paintballs. The quantity varies from 100 balls to 1000+... the record is 5200. The players that blast though their first 100 paintballs are usually the players that have bought a bulk paintball deal so they have a lot of paintballs to shoot. Our referees are trained to run groups that have minimal paintballs through to trigger happy groups. We want all players to have an awesome day, have a good amount of playing time and play different games on different fields. You can buy a bulk pack & save money. So you don't have to line up through the day to buy paint refills & miss out on games. You can wear a harness with up to 400 paintballs on your back & reload as needed. Your referee can help players be trigger happy or conservative. Your referee will know how to structure your day & what games to play. How much time should we allow for paintball? On average groups are at the field for approx 5 hours. Some groups are quicker and some groups will play all day from 9am to 4pm (or 5pm if players still have paintballs to shoot off). Are there waiver forms to complete? All players are required to complete a waiver form. Players under 18 years of age MUST also have their waiver completed by their own parent or legal Guardian. Waivers MUST BE NEAT & COMPLETED 100% to be able to play. Waiver forms that are illegible, missing information, filled out incorrectly etc will be rejected. Waivers are available at the field on the day or down load & complete. Click here to open the Waiver Form. Players must wear enclosed shoes. Sneakers/joggers with good grip are recommended for normal conditions & turf shoes/footy boots are recommended for wet weather & advanced players (no metal blades or spikes). We provide custom camouflage overalls for players to wear whilst playing. We recommend players wear shorts & T-shirt/singlet under their overalls all year round. If it is a hot day feel free to strip off more clothing under your overalls to keep cool. We have free hire of padded vests if required. Can we wear our own gear? 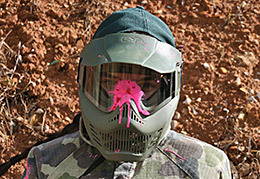 Players are welcome to wear & use their own paintball playing gear. Masks must be in good condition & inspected by Paintball Park staff before use. Is there a paintball gun upgrade? We offer a 14 inch Genuine Tippmann Sniper barrel rental upgrade for $10. We tested a sniper barrel against an original barrel and found the grouping was greatly improved. Our field owner / manage uses 14 inch barrels on ALL his own personal tournament paintball markers. Our rental markers (paintball guns) are the best and most reliable rental paintball markers we have come across over the 20+ years of paintball experience. Can we use our own marker (paintball gun)? Players are welcome to use their own paintball guns. Gun will be chronographed & must not shoot over 300fps (customers paint used). Only Paintballs supplied by Paintball Park on the day are to be used. This is for player safety, environmental protection, to prevent staining of equipment & customers clothing etc. Games can be played in light rain. If rain becomes heavy or conditions are unacceptable then games will be stopped until conditions are acceptable. If rain is heavy in the morning we will still set up & be prepared to run paintball games. Due to our field location we don't get a lot of rain during the day at Paintball Park. If we do have rain in the morning it usually clears by 9am-10am. Paintball is an extreme sport that can be played in most weather conditions. Paintball Park monitors weather leading up to paintball days & on paintball days. For player safety if Paintball Park believes conditions are too extreme then games will be stopped or called off & we will discuss the options with players. Groups start as early as possible. If there is rain players have time to stop & let it pass. Once conditions are acceptable games can continue. Players drink water before & during paintball to keep hydrated. Players eat a good healthy breakfast. Players wear joggers with good grip. Players play to the conditions. For example if it is wet players should use their gun skills more than running around. Can we play on hot days? Paintball is an extreme sport that can be played in most weather conditions. Paintball Park monitors weather leading up to paintball days & on paintball days. For player safety if Paintball Park believes the weather conditions are too hot then games will be stopped or called off & we will discuss the options with players. On warm & hot days players are brought in more frequently for drink breaks & we often have a misting station set up for players to cool off. Groups start as early as possible to beat the heat e.g 9am, 10am etc. Players drink water the night before, the morning of, during & after paintball games. Players eat a good healthy breakfast/lunch. Players play to the conditions. For example if it is hot players should use their gun skills more than running around. The only time we require a minimum amount of players in your group is if you are the only group on the day. We normally have multiple groups playing every Sat & Sun so normally on weekends you don't have to worry about the minimum amount of players. We require a minimum of 8 players to open the field. If you are the only group on the day & you have less than 8 players we can still open for you but we require the following paintballs to be bought per player. Can I pay the deposit over the phone? Yes. Please phone 8362 3456 or 0413 144 992. Players and Non Players must not consume alcohol / drugs prior to or during paintball games. We have a zero tolerance policy (i.e. 0.00% Blood Alcohol Concentration). If we see, smell or suspect a person or persons has consumed alcohol or drugs, they will be refused from participating in paintball games and will be required to leave the premises immediately. Paintball Park is a registered shooting range and paintball markers (paintball guns) are registered firearms. It is illegal to handle a firearm under the influence of drugs or alcohol. Please note: This maybe a compulsory reportable incident to SA Police. As we do not have a liquor license, it is illegal for anyone to consume alcohol on the premises at any time. Refusal to play is at the discretion of management. Deposits and / or purchases will be forfeited and no refunds given if any of these rules have been breached. Is it cheaper for kids? The short answer is the prices are the same for kids and adults. 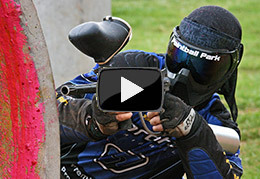 In 2005 Adelaide's Paintball Park opened with some great specials. We worked out the best price we could get players (kids & adults) on the field. Many years later and we have maintained the same entry price and have managed to create some discounted bulk deals for extra paintballs. We work extremely hard to keep the prices down for all players whilst providing quality rental equipment and paintballs. We help players to be conservative with their paintballs, when required, and we are the only paintball field we have come across in 20+ years that does this. We structure the day based on what paintballs players have, ages, occasion, time available etc to give players the best paintball day possible. It is not listed on our prices page however we do allow players to buy 50 paintballs for $10 & 25 paintballs for $5. What is the cost to play paintball? Please Click Here to go to the Prices Page.